Samsung has long been dropping hints that there will be a Samsung Galaxy S5 Exynos version. But finally, it has detailed on its official blog, the Exynos processor that a Samsung Galaxy S5 variant will come with. Not just that, it has also detailed an Exynos 5 hexa-core processor headed for the Samsung Galaxy Note 3 Neo. But, Samsung mentions nowhere in its blog post that these processors will be headed to the respective smartphones. Then, how do we know? Well, because the octa-core processor detailed, the Samsung Exynos 5422, is the same 2.1-GHz processor that surfaced in a Samsung infographic about the Samsung Galaxy S5 and then quietly disappeared. Coincidence? We don’t think so. This processor can run all eight cores at once and supports 2560 x 1600p displays along with 4K video recording. It will run on four 2.1-GHz Cortex A15 cores and four 1.5-GHz Cortex A7 cores. 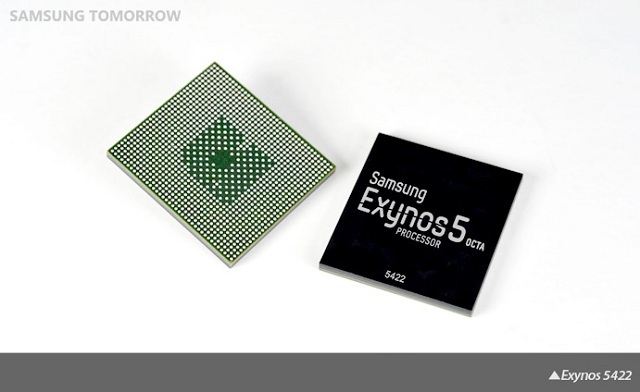 The other processor detailed – the Samsung Exynos 5260 also known as the Exynos 5 Hexa, will come with 6 cores and will be headed to the Galaxy Note 3 Neo. It will run on two 1.7-GHz Cortex A15 cores and four 1.3 -GHz Cortex A7 cores. Samsung has always been releasing different variants of its flagship devices (remember the Galaxy S4 Zoom, Galaxy S4 Activ and Galaxy S4 Mini? ), so its not too big of a surprise that it has something planned for these devices too.